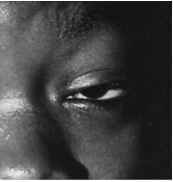 Figure 41-29 Ptosis of left upper lid in 8-year-old patient who had ocular myasthenia and subsequently developed ptosis of right upper lid and exotropia. Figure 41-28 Congenital ptosis in 4-year-old patient with congenital bilateral ptosis. cranial nerve III. 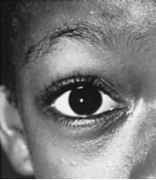 Acquired forms of ptosis include myogenic forms, such as myasthenia gravis and progressive external ophthalmoplegia, and neurogenic forms, such as Horner syndrome and cranial nerve III palsy (Fig. 41-29). Pseudoptosis is caused by conditions giving the appearance of a ptosis. 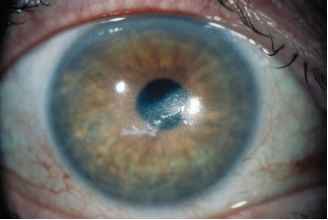 It is particularly common with microphthalmia (small eye, or phthisis bulbi). 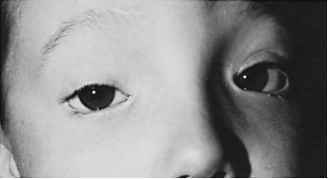 Pseudoptosis may also be secondary to hypotropia. Congenital ptosis generally is corrected with bilateral fascia lata brow suspension or a levator resection in patients with good levator function. Treatment of adult forms of pto-sis includes correction with a tarsoconjunctival resection, strengthening of the levator aponeurosis, and levator resection.